This cover went into the mail in Croydon, Queensland. Croydon is about 150 km inland from the Gulf of Carpentaria on the north side of Australia. Croydon was a gold mining town. This isn't the Croydon that is a district in Sydney nor the Croydon near Melbourne. This one isn't even near Brisbane, the capital of Queensland! It's about as far from Brisbane (2463 km) as you can get and still be in Queensland. The cover left Croydon after receiving five strikes of the rimless Croydon CDS. The '9' is in the slot where the time slugs are placed although this one is incomplete. 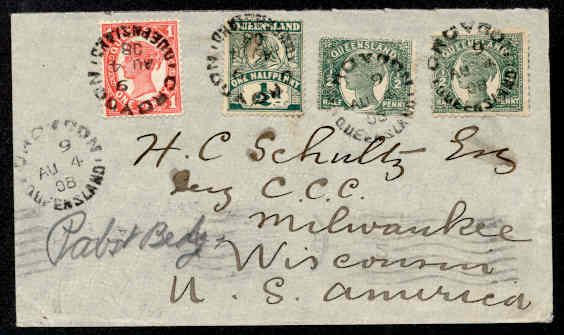 The cover is franked with two 1895 ½d. green Victorias (SG 208, 219, 223, or 227). There is also a 1907 ½d. deep green Victoria (SG 286 or 301). There is also a 1907 1d. vermilion Victoria (SG 287 or 302). Its destination was Milwaukee, Wisconsin. Milwaukee is on the western shore of Lake Michigan about 85 miles north of Chicago. means and it probably baffled the postal clerks. They added Pabst Bldg in pencil. For those who don't know, Milwaukee is a big brewing town. The local baseball team is even called the Brewers. Pabst (must be 21 years old) was one of the brewers. there is probably a machine receiver on the rear. which probably occurred during processing of a stack of covers. be the Crown Cork Corporation, also known as Crown Cork and Seal. and maintained an office/agency there, although officially based in Philadelphia, PA."
*Thanks to Marius Wytenburg and Maarten Willems for their input regarding the CDS.